The A.T. Still University (ATSU) Doctor of Health Sciences (DHSc) online program prepares students to better understand and effectively manage and evaluate solutions to the ongoing challenges of healthcare access, cost and quality. This advanced online health science degree program provides health professionals with the knowledge and skills to excel in project management, decision-making, organizational leadership, establishing evidence-based standards and gaining competencies to apply research to professional practice. Offered through the ATSU College of Graduate Health Studies (CGHS), the health science degree online program consists of 70 credit-hours of study. Students have the opportunity to focus on one of three concentration areas: Global Health, Leadership and Organizational Behavior, or Fundamentals of Education. The health science online degree program promotes application of research to professional practice through completion of an applied research project. 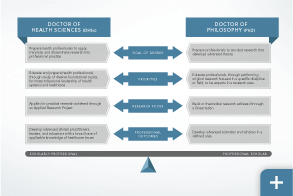 The Doctor of Health Sciences degree is a unique approach to doctorate level health education. 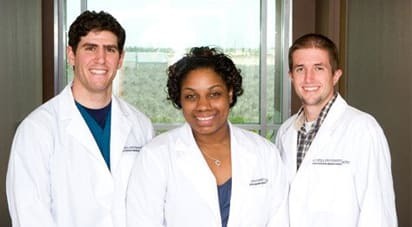 The ATSU Doctor of Health Sciences degree provides interdisciplinary scholarship and added value to health professionals in comparison to the traditional PhD. The ATSU Doctor of Health Sciences degree post-professional program offers focused, interprofessional learning in a flexible, online environment tailored for busy healthcare professionals. 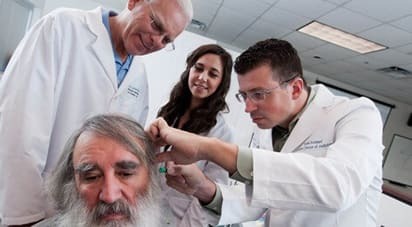 The online health science degree is achievable in three years, has various areas to concentrate learning and 100 percent of study can be completed online. Read the University Catalog to learn more about the Doctor of Health Sciences online program and university. 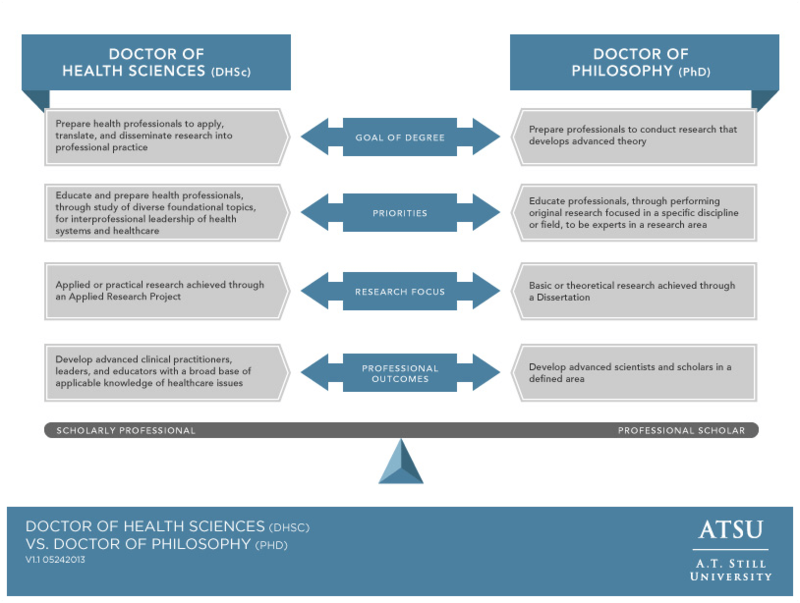 I think what best summarizes my choice of the DHSc was its direct relation to health sciences as opposed to some of the more arcane disciplines inherent in many PhD programs. This is not an exercise in merely obtaining a doctorate degree but in obtaining a degree which can actually further my educational and professional goals. The DHSc is the best of both worlds. It is the integration of both research and practice. It is the focus on applied research with the end goal to affect the delivery of healthcare. I wanted more of a liberal and critical preparation approach to academics. The DHSc fits the need. It prepares us for clinical continuation, but has the applied portions of thinking infused with research. Dr. Mathieson completed her PhD in sociology at Arizona State University, with a focus in the areas of statistics and sociology of health. Before coming to ATSU, she spent five years as a research analyst and biostatistician at Maricopa Medical Center, a 449-bed teaching hospital in Phoenix. Dr. Matthews completed his PhD in education at Southern Illinois University with an emphasis in adult and vocational/technical education (workforce education and development). He also holds graduate degrees in education (administration and supervision) and museum studies. 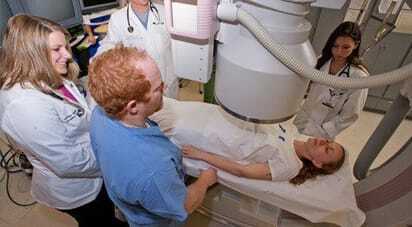 His professional medical preparation is in the field of diagnostic imaging. Dr. Matthews is certified in diagnostic radiography, cardiovascular-interventional technology, and magnetic resonance imaging by the American Registry of Radiologic Technologists. Prior to coming to ATSU, he was the program director of the radiography program at Southern Illinois University. Dr. Salisbury earned her PhD in Biopsychology from the State University of New York at Stony Brook, where she completed some of her coursework and her externship with psychiatric residents from the University Medical Center’s Medical School. While at Stony Brook, she taught Research Methods and Statistics, and worked as the project director and statistician/database manager for a large NIMH grant. Dr. Salisbury worked at Banner Good Samaritan Medical Center, as part of the Clinical Neurobiology and Bioengineering Research group, and then as the research coordinator for trauma and general surgery, where she mentored trauma surgical residents in proposing, designing, analyzing, writing, and submitting required clinical research studies for publication. Additionally, Dr. Salisbury has worked for Scottsdale Healthcare Osborn, where she was the coordinator for trauma clinical research and served on the hospital’s Scientific Review Committee. Currently, she is also on the research faculty of an online university where she reviews doctoral dissertations for appropriate research design and analyses, and is a strong proponent of distance education. The Doctor of Health Sciences (DHSc) online program consists of 70 credit-hours of study. Most courses are three credit hours, a few are five credit hours, and the Winter Institute is six credit hours. There are additional fees for books, reference materials, Winter Institute travel, and accommodations. Federal financial assistance is available for qualifying students. For information about financial aid, visit ATSU’s Enrollment Services online or contact them at 866.626.2878 ext. 2529 or by email at enrollmentservices@atsu.edu. The Doctor of Health Sciences (DHSc) online program consists of 70 credit-hours of study. The DHSc degree curriculum aims to develop and enhance the professional skills needed to provide competent leadership in today’s challenging healthcare systems. The purpose of this course is to establish a solid foundation of writing skills and familiarize students with the writing policies and expectations of The College of Graduate Health Studies (CGHS). Emphasis is placed on scholarly writing elements, including annotated bibliographies, American Psychological Association (APA) format and style, effective use of evidence, literacy skills, academic integrity, review and critique of literature, and rhetoric. The course examines the characteristics of critical writing that are assessed throughout the program to identify students’ knowledge, comprehension, application, analysis and synthesis of content. This course introduces principles of management and decision-making as they relate to the health care sector. Students will become acquainted with management and decision-making tools and how they can be applied in health care delivery and administration. The modules link the management functions of planning, organizing, communication, and legal aspects of human resources with decision-making for achieving positive outcomes. Students will explore models for effective committee work and the roles of committee chairs, as well as the concepts of power and authority, organizational structure, and delegation of duties. In preparation for assuming the role of a health care manager, regardless of the setting, this course focuses on the development of new skill sets that are essential for a successful transition. This course provides an introduction to quality healthcare and risk management as it relates to and interacts with the broader picture of quality improvement. The course will explore many important issues pivotal to promoting quality healthcare. Topics that will be discussed in the course include: how are quality outcomes defined and measured; who is responsible for measuring health; and what are the prominent quality improvement theories used in healthcare. In addition, the results of data from studies describing how the United States health system is performing; and what are quality initiatives that could be implemented to enhance healthcare are highlighted. This course will provide students with the opportunity to examine the application of technology to obtain and use data, knowledge, and information in the field of health care. Students will understand how application of technology in healthcare has become increasingly critical to patient care, quality, effectiveness, efficiency, and overall operations. With increased government support for healthcare information systems, health information technology will be the base of support for clinical and management decision-making. This course also explores the issues, benefits, and challenges of using health care information systems. Emphasis will be placed on applications that directly impact government initiatives, business operations, and patient safety. This course provides non-legal health professionals with a concrete foundation in healthcare law and ethics. 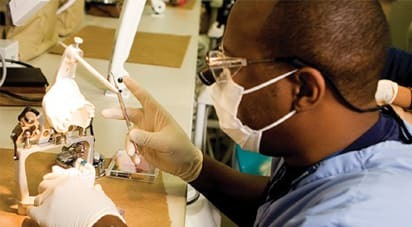 The goal is to assist students in developing practical approaches to improving the excellence and delivery of healthcare. Healthcare decisions are especially apt to have some form of ethical consequence. This course is designed to provide a basic framework from which to consider these consequences, as well as give the healthcare professional tools that will assist in times of ethical dilemmas. This course will reflect on the national goals for health promotion through reviewing current public health documents. This course will assist in the development of a health promotion plan that could be incorporated at an individual, group, or community level. To fully understand the processes necessary to implement health promotion initiatives as a health professional, studying and discussing the development of health promotion programs is necessary. The course will explore the common issues threatening the health status of society. 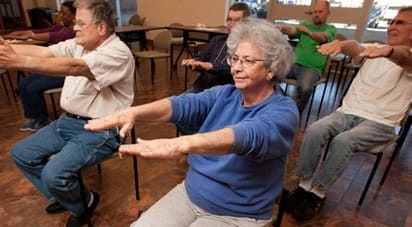 The steps and processes required to develop or evaluate a health promotion initiative will explored and evaluated through group work throughout the course. This course introduces the historical development, structure, operation, function, and current and future directions of the major components of healthcare delivery systems. 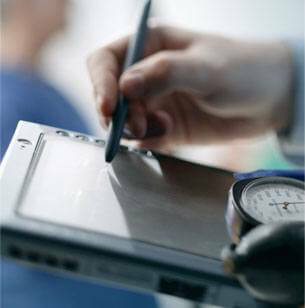 The course will explore how national systems have evolved and how countries confront the emerging issues in healthcare. Specific topics discussed will include the historical evolution of health systems, the various models that are used around the world, the main components of a health system, and the criteria used to assess the functioning of a health system. Included will be discussions around how health systems can be reformed and what strategies may be used to accomplish this. This course examines many of the issues that are believed to influence the health of the global population. As the world is being challenged daily with forces of nature and manmade dilemmas, we are all tasked to influence and alter the trajectory and consequences of many of these negative stimuli. The course will explore many prominent themes and issues that are believed to influence the health of populations. Topics that will be discussed in the course include how population health is influenced by urbanization and migration, climate change, culture, the media, social and economic class, gender, employment status, and political and health systems. This course introduces the concept of continuous quality improvement as a means to evaluate and improve health care outcomes. Continuous quality improvement (CQI) has presented a great opportunity to the health community but it is not a remedy for all health system problems. CQI represents a perspective and framework for on-going development processes leading to increased customization and co-configuration of health services and strategies for health care reform. It is one of an array of approaches that health care leaders should be using to improve the effectiveness and efficiency of health services, along with patient-centered care, evidence-based medicine/management, clinical pathways, and process re-engineering. This course is the first in a series of six courses designed to assist you with the development of an applied research project (ARP). This course provides an introduction and overview of research methodology and design. Quantitative, qualitative, and mixed methods approaches to examining a problem and finding answers to unresolved issues will be explored. Topics that will be discussed in the course include: how to select the best research method and design for the problem under study, the purpose of a literature review, ethical considerations for research, and the most appropriate data collection tools and analytic principles that should be employed. The purpose of the course is to introduce the research process, and the methods, designs, and analytical tools required to critically evaluate research articles in preparation for initiating the ARP. The main focus of the course will be to gain skills in reviewing and critiquing research. This course is designed to assist health professionals with learning how to integrate high-quality research with clinical expertise, critical thinking, and patient values for optimum care. Systematic methods for critical appraisal of study quality, research design, strength of research recommendations, and quality of literature pertaining to a specific clinical problem will be presented. Evidence-based resources and databases for health professionals will be identified. Methods will be explored to promote health professionals’ participation in learning and research activities to the extent feasible. This course is the second in a series of six courses designed to assist you with the development of an applied research project (ARP). Understanding the past and current literature in the ARP topic area is crucial to the development of a sound research project. Therefore, the purpose of this course is to provide you with the knowledge and skills to successfully review the literature around your chosen ARP topic and write a focused review of literature. This course is the third in a series of six courses designed to assist you with the development of an applied research project (ARP). The purpose of this course is to provide the knowledge and skills necessary for the development of the ARP proposal. The proposal is crucial to the success of the ARP, as it provides the rationale and significance, the purpose, and the methodology of the proposed research study. During this course, students will work closely with their Facilitator to ensure the proposal is methodologically sound. By the end of this course, students will have completed the proposal and submitted an application to the ATSU Institutional Review Board (IRB) for approval to conduct the research study. This course is the fourth in a series of six courses designed to assist you with the development of an applied research project (ARP). The purpose of this course is to provide you with the knowledge and skills necessary to implement your sampling methodology, successfully collect and properly manage your data, and become familiar with the statistical software package, IBM SPSS, that you will use to analyze your data in the upcoming data analysis course. This is the fifth in a series of six courses designed to assist you with the development of an applied research project (ARP). This course provides an overview of basic quantitative and qualitative data analytic techniques. Students will learn the concepts of descriptive and inferential statistics as well as the process of qualitative coding and analysis. In addition, students will learn to effectively use data analysis software to analyze research data. At the end of this course, students will have conducted data analysis for the ARP and will have completed a full results section to be used in the final research manuscript. This course, the final in the Applied Research Project (ARP) series, focuses on providing students with the knowledge and skills needed to successfully complete an ARP manuscript and to disseminate research findings. Directed studies may be required as assigned by the program chair. This course provides an introduction to important global health issues, including determinants of health, key areas of disease burden, and the role that new health technologies can play in solving these problems. The goal of the course is to expand students’ understanding of the impact of infectious and chronic diseases on the world’s population with particular attention paid to the health status of women, children, and the poor. Students will examine case studies of successful global health interventions to understand features of successful programs. This course introduces the theoretical and practical issues associated with the radical global processes that are now affecting human life locally and globally. The course emphasizes the political-economic, cultural, institutional, technological, and ecological implications of globalization and allows students to evaluate whether these processes pose opportunities or challenges to individuals, societies, and the global community. This course provides an introduction to the principles and theory of ethics as applied to global health. The course will examine some of the primary theories and principles in healthcare ethics including virtue, deontology, utilitarian, autonomy, justice, beneficence, and nonmaleficence. The course will explore many prominent global health issues and exemplify how greater knowledge and understanding of global ethics is vital to effective and sound decision-making. Topics that will be discussed in the course include ethical issues related to: pandemic preparedness, end of life, human organ transplantation, clinical research in developing countries, human rights, resource allocation, and the effects of globalization on world health.